Brian Epstein is the man who discovered The Beatles, replaced Pete Best with Ringo Starr, and came up with matching suits and the synchronized bow at the end of each performance. Until his overdose of the sleeping pill Carbitol in 1967, Epstein was involved with every aspect of The Beatles' professional lives. 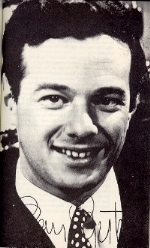 Epstein managed many other musical groups and was the host of U.K. TV show Hullabuloo.